Michelle and I are at LAX airport, waiting for our flight back home to Missourah. I am SOoooo fired up. (Had to use several OOoohs!) 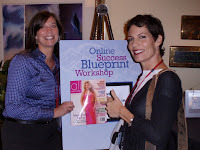 We just attended Alexandria Brown’s workshop on online marketing. Here’s what I learned. It isn’t about marketing. It’s about choosing…to inch along or take a quantum leap. We are leaping, baby! The planet is well served by your, and our, extraordinary business. We are here to help, to serve you. If you are ready…let’s go go grow together! One of my “light bulb” moments this week: You are well served to go to class once in a while. You can surround yourself with people who challenge you, who are smart, and focused…and wealthy. You can find a reason to get up in the morning that’s bigger than turning wrenches or building websites. You can set down your baggage and take the leap.